cottage in the Loire — comfortable, relaxed (with a glass of good wine) and confident you’re about to hear a great story. 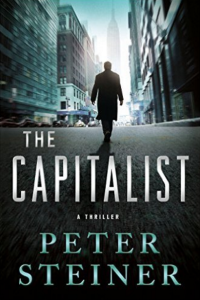 I came to Peter’s books with The Resistance, when he presented it at the American Library in Paris. His protagonist, Louis Morgon, is a retired (not by choice) CIA spook and sort-of diplomat who settles in the small French town of Saint-Léon-sur-Dême, which, in his depression after being fired and divorced, he chooses in a very simple way: he gets off the plane at De Gaulle airport, hitches up his backpack, and starts walking south. When he gets to a place he likes, he stops and settles in. In The Resistance he bought a long-abandoned house where he found a stash of World War II pistols used by the Résistance, thus the title. I reviewed that here. By now Louis is getting older. He’ll never see 70 again, but he’s accumulated a deep network of friends, including the local policeman (Renard) and a lover (Pauline), who play outsized roles in The Capitalist. Over the years in Saint-Léon-sur-Dême he’s become an accomplished painter, a skill that plays an oversized role in the resolution of the story. I don’t know Peter Steiner well, in fact hardly at all. I met him that one time in Paris and exchanged emails with him, and he was nice enough to write a blurb for my novel Last Stop: Paris. I do know that he lives part of the year in France, and have to think that informs his descriptions of village life, just as my time in Paris informs my writing. He’s been in the creative world for a very long time, mainly as an acclaimed cartoonist for The New Yorker, then as novelist. 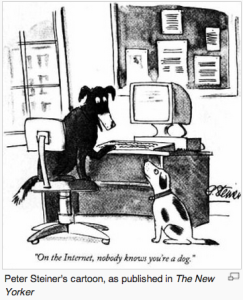 Remember the one from 1993, captioned “On the Internet no one knows you’re a dog?” That was Peter’s, and it’s the most-reproduced cartoon in the magazine’s history. Morgon’s bête noir is St. John Larrimer — “he pronounced his name SIN-jun in the English manner,” a little touch that tells you everything you need to know — a mini-Madoff who succeeds in fleecing all his money management clients. The most tragic of them is Pauline’s brother Jean-Baptiste, an unaware man who decides it’s easier to send his clients’ money to Larrimer than to manage it himself, so it’s gone. Unfortunately, he told them he was the manager, which turns out to be illegal, and his way out is to slit his wrists. Pauline, her family and friends are seriously hurt, not least by the money they lost, and Louis is furious. As he has in the past, he determines to do something about it, and he does. Stick with it through the first couple of chapters, which deal with some of the collateral damage of the excessively enthusiastic capitalism that marked the first few years of the century — it’s what James Michener called “weeding out the ribbon clerks.” Don’t be one of those and you’ll be amply rewarded. The plot is complicated and tricky, and the best tradition of this kind of novel it’s very hard to tell if the good guys win or lose. I think I know, but I suggest you form your own opinion.